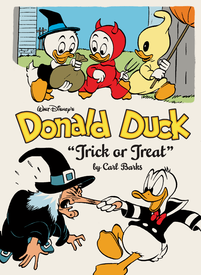 The Copacetic Comics Company | Donald Duck: "Trick or Treat"
Yes! The latest volume in the epic 30-volume Carl Barks Library has arrived (we believe that this is Volume 15, despite it stating that it is Volume 13 on the copyright/indicia page). This one is perhaps the most riotous volume yet, filled with more fun-filled antics than any other yet published. This is due in no small part to Fantagraphics' decision to follow the stories that make up Donald Duck No. 26 -- one of the last wholly by Barks -- which includes the title track "Trick or Treat", with a whopping fourteen consecutive classic 10-pagers! Originally published in a stretch that ran from late 1952 through 1953, these 10-pagers are filled with the comedic splapstick antics that Barks arguably did better than anyone else in comics, ever, and this volume has some of the best, including the back-to-back masterpieces, "The Hypno-Gun" and "Omelet." Also on hand here are the classic Barksian philsophical exploration, "Flip Decision" and the neo-classic all-American fable of choice and faith, "Some Heir Over the Rainbow." Comics don't get any better than this.